A HUGE THANK YOU and CREDIT ACKNOWLEDGEMENT to both Bernat and Steve Phelps﻿, who calculated the surface equations for the curved parts of the cylinder's lateral area (during the unwrapping process). This enhanced version (of this original version﻿) would not have been possible without their insight. 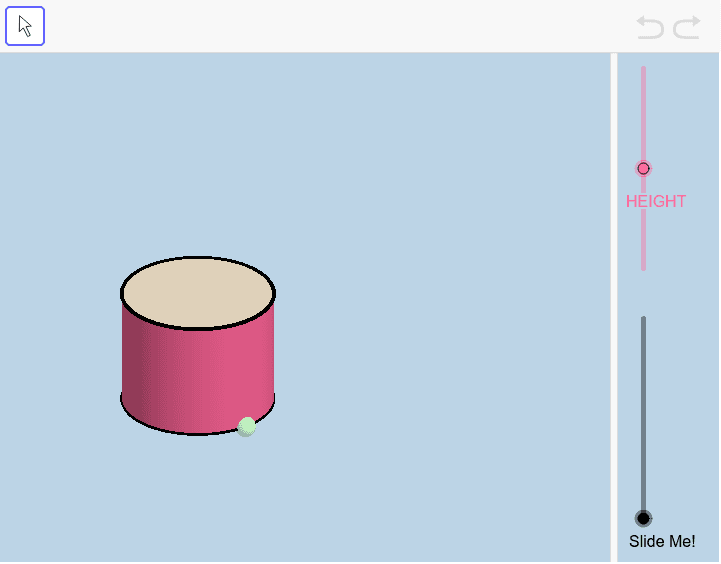 To explore this resource in GeoGebra Augmented Reality, see the directions below this applet. 1) Open up GeoGebra 3D app on your device. 2) Go to the MENU (horizontal bars) in the upper left corner. Select OPEN. In the Search GeoGebra Resources input box, type rCxXxFhE (Note this is the resource ID = last 8 digits of the URL for this resource.) 3) In the resource that uploads, zoom in/out if needed. ﻿The r slider adjusts the radius of the cylinder. ﻿The h slider adjusts the height of the cylinder. ﻿Drag the slider named i to wrap/unwrap.